Divine. Prep all 3 ‘layers’ ahead…assemble before you enjoy, and everyone will be speechless. Borrowed from bon appetit (I was catching up on August 2012, just a few weeks ago), I wouldn’t have made it if Katie, and then Kyla, hadn’t made it first! – enjoy! Preheat the oven to 375, roll out your crust as you would – but make the circle larger than usual. 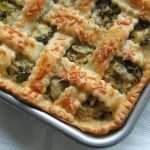 Crimp the edges so that they’re almost overhanging the edge of the plate (you need an extra-high edge), prick the crust all over with a fork, line it with foil and fill it with pie weights (or dried beans). Bake for about 20 minutes, then remove the weights and foil, and bake it for another 5-10 minutes until it’s a lovely golden brown all over. Allow the crust to cool completely. Turn the oven to 350 and put all of the halved plums, 1 1/2 cups of sugar and lemon juice into a large bowl and mix well to combine. Scrape in the seeds from one half of the vanilla bean and mix well again – try to distribute the seeds as much as possible. Divide the plum mixture between 2, 9 x 13 glass dishes, arranging the plums cut-side down. Roast until the plums are tender but not falling apart and the juices are bubbling – the original recipe recommends 40-60 minutes, my plums were good and ripe so 30 minutes was enough. Leave the plums to cool enough to handle. Using a spatula, transfer the plums (not the juice) to a rimmed baking sheet, and cover well with plastic wrap. Put them in the fridge until you’re ready to assemble the pie, it works better if the plums are cold – I prepped them to this point the day before. Scrape the juices into a small pot, bring to a boil and reduce by at least half until you have a thickened syrupy glaze. I started with almost 2 cups of juice, so this took a while – watch it carefully – it would be a tragedy if the juice burned and ruined! I also did this the day before and refrigerated the plum syrup overnight – cold, again, is extra tasty. For the creamy layer, add the mascarpone, creme fraiche, honey and remaining sugar to the bowl of your electric mixer, and scrape in the seeds from the second half of the vanilla bean. Beat on high speed, scraping down the sides as needed, until the mixture holds firm peaks – this can also be done ahead, covered and chilled. 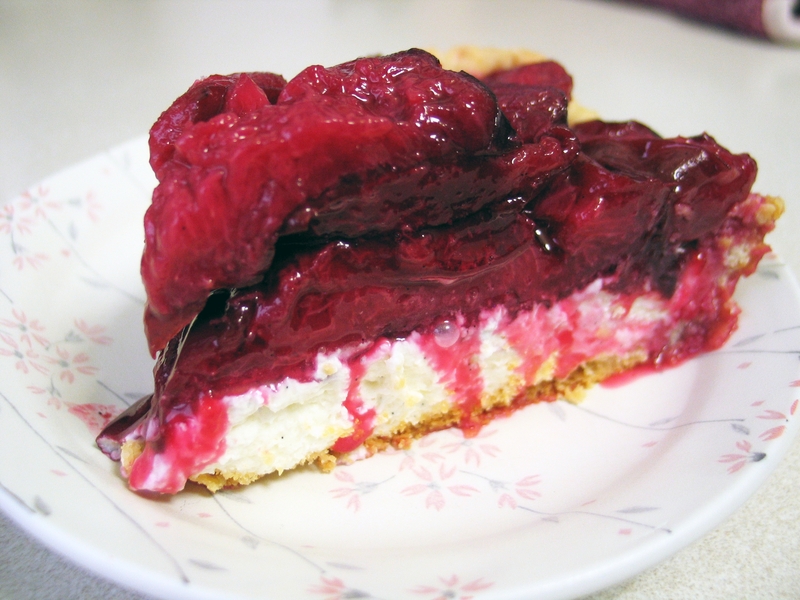 To assemble the pie – Spread the mascarpone mixture over the cooled crust, and then layer in the plums. 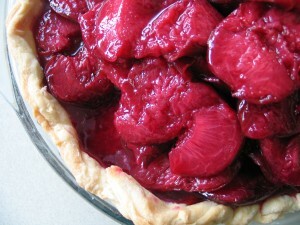 Starting at the outside edge, line the pie bottom with plums – tightly but not overlapping, going in a circle so that you finish in the middle – skin side down looks best. Start the second layer at the outside edge again, arranging the plums tightly and forming a second spiral – you should end up with a slightly domed center when all of the plums are placed. If your plums look dry, use a pastry brush to brush on some plum syrup – if the syrup has firmed up, add a touch of water and reheat gently until it’s pourable – mine was like maple syrup right out of the fridge. To serve – cut large slices, add whipped cream if you wish, and drizzle with more plum syrup – savor each mouthful…there won’t be any left!